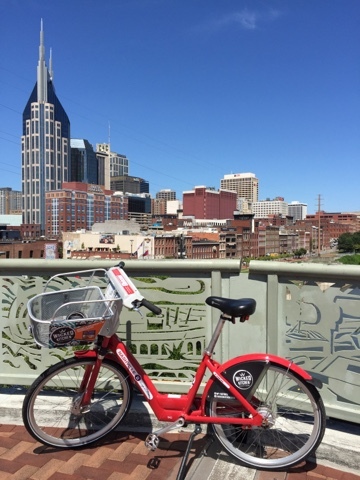 Today's fun started out eastward on the Music City Bikeway with Nashville B-cycle. How could I not stop on the Shelby Street Pedestrian Bridge and take an obligatory B-cycle skyline picture? From the other side of the bridge the Cumberland River and the building wherein I'm staying. 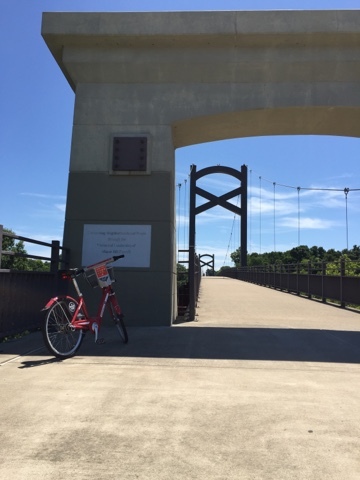 The Music City Bikeway is 26-ish miles long from start to finish. Downtown is roughly the half-way point. 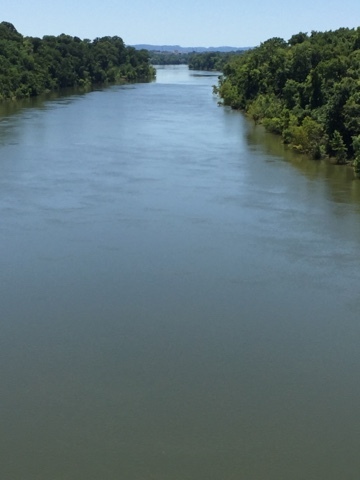 Going east it follows the Cumberland River out of town until it follows the Stone River. Not coincidentally it switches to the Stone River in what is called the Two Rivers area. Very early on I found myself on Davidson Street with a shiny brand new protected bike lane. This road leads to LP Field - home of the NFL Titans. 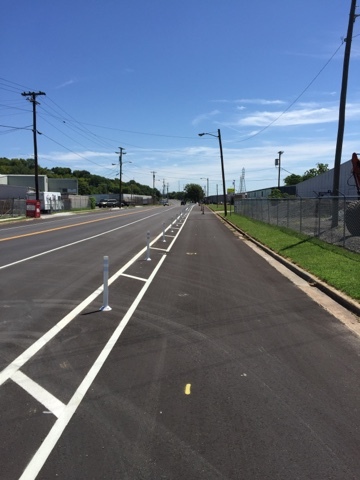 The east bound lanes are being converted from right to left to an 8'-10' bike lane, 2'-3' buffer w/ bollards, 10' for parking and 10' for driving. It wouldn't surprise me if the bike lane will be two-way, but I saw no markings indicating that. I know the rest of the details because there were signs that even drivers might be able to understand. 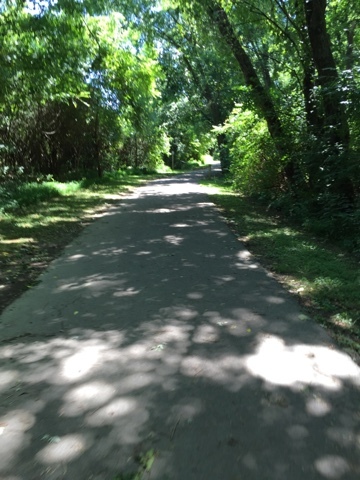 Much of the trip featured multi-use path with heavy tree cover. At 95-degrees the shady parts were quite welcome. 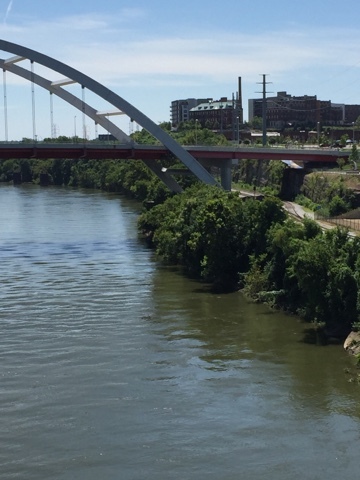 This rather substantial bridge crosses the Cumberland River. 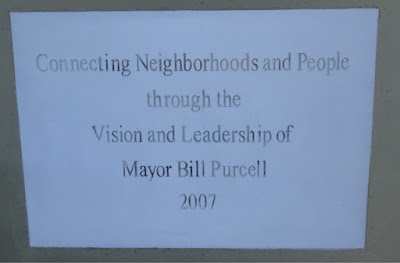 Apparently the 2007 Mayor of Nashville's vision and leadership were key factors in the bridge's creation. I think a marker like this would look great on a bridge crossing I-229 in south Sioux Falls. 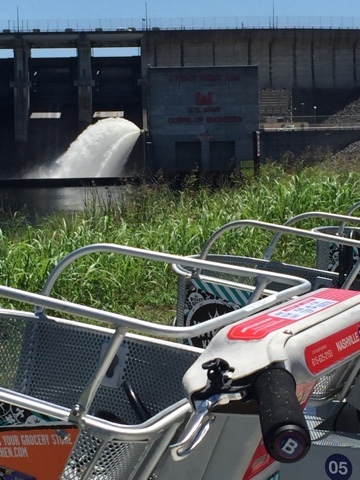 14-miles later I and my 40lb 3 speed B-cycle found the J. Percy Priest Dam. That water looked positively glorious to me. After refraining from jumping in I turned around and headed back from whence I came. 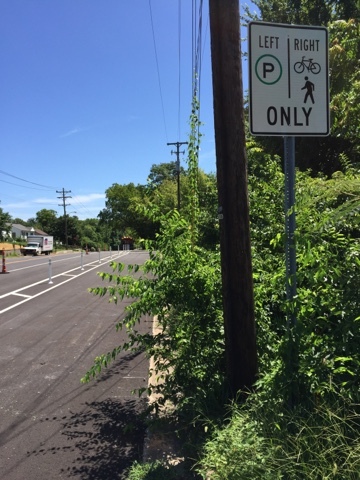 Did Nashville mention they were a League of American Bicyclist's Bicycle Friendly Community? In 2012 they received the bronze designation. Sioux Falls got bronze a few years ahead of Nashville. From what I'm seeing Nashville will advance to gold or better more quickly. 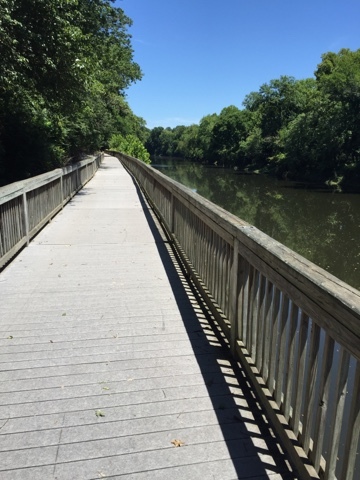 Because of a steep drop to the river and proximity to residences one section of the Stone River Greenway is boardwalk built out over the river. That's a nice interesting feature. A cycletrack! 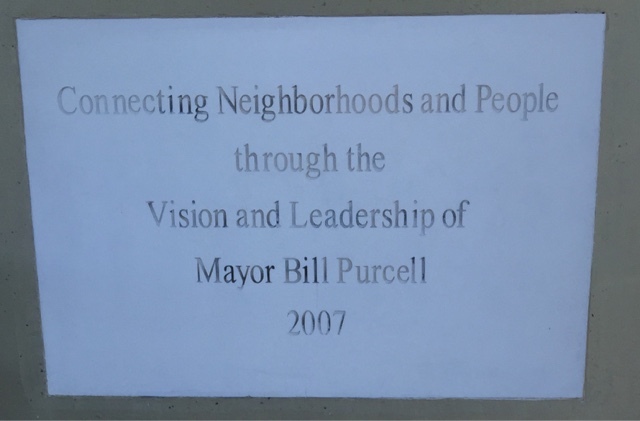 This is incorporated into the sidewalk outside the Ascend Amphitheater. I didn't look at it too critically but I suspect the transitions at the beginning and end into traffic are problematic. 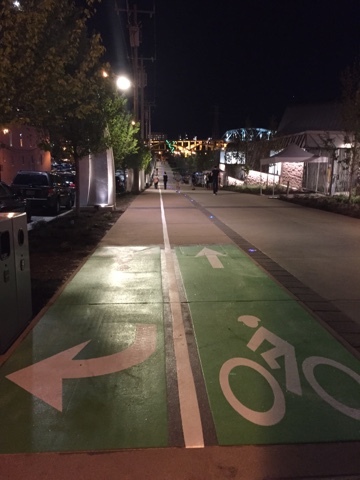 At night the cycletrack is separated from pedestrians with purple lighting every 20'. I tried hard to show that feature with this photo. After the bike ride I walked the 3 mile round trip from my lodging to the Polk Auditorium in the Tennessee Performing Arts Center where the showcase began. On the way I stopped off at Jack's BBQ for ribs - no photos, sorry. Picture a plate of ribs. Here's a picture from the back row of tonight's single showcase. 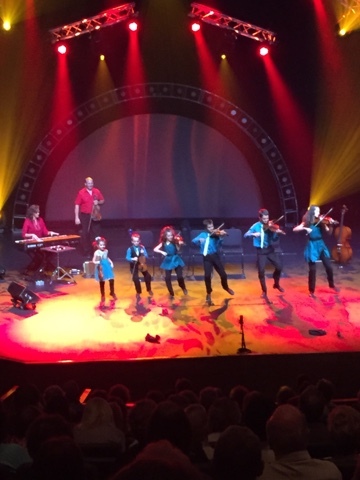 The Next Generation Leahy's are a family of very talented instrumentalists, singers and tap dancers. Very nice! I'm a sucker for tap dancing four-year-old kids. Eric Church was performing outdoors tonight. After I put the chaos and noise of Broadway behind me the second half of my walk was accompanied by his live music. A very nice ending, really. For the past 3 years I've been presiding over Live On Stage: Sioux Falls Concerts Association. Every year this group promotes five concerts at the Washington Pavilion. Every year this group goes to Nashville to see a showcase of talent from which we pick our five concerts. I flew here - which is really bad from a The MinusCar Project perspective. I suppose it's something like the equivalent of driving 100 Hummers the same distance. Or maybe more. It's the downside of doing interesting things. Similar to my time with the South Dakota Bicycle Coalition - I don't have much of a stomach for driving to encourage bicycling. Nevertheless, I'm in Tennessee. I expect much music, biking, BBQ and baseball. We'll see how it goes. From airport to lodging I opted for the $1.70 MTA trip to downtown. I assume other options are $30. Maybe a hotel shuttle option is free, but I'm not in a position to take advantage of that. As I rode the bus I became complacent. 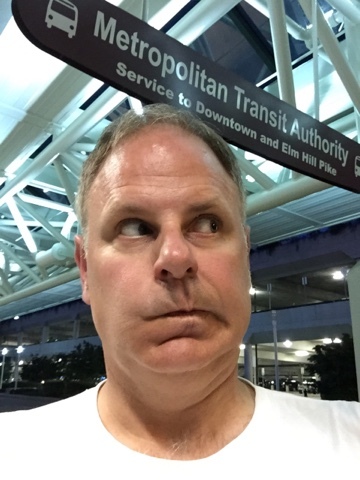 Apparently I've gotten accustomed to my The Boy 13 navigating public transportation because I completely failed to pay attention to getting off my bus at Music City Center. That's HIS job and he's not here. Maybe I need a refresher course! I rode back around on the route and arranged a new meeting spot outside The Country Music Hall of Fame where my host picked me up and drove me to his condo. I'm staying in an Airbnb, which is a new experience for me. He was confused that I was on a bus but at the airport. I explained my car-free thing and he noted Nashville is made for cars but trying to do better. Yeah, aren't we all. I have his place all to myself. It's the downtown living experience without the recurring cost. I can see LP Field - home of the Titans from my window. 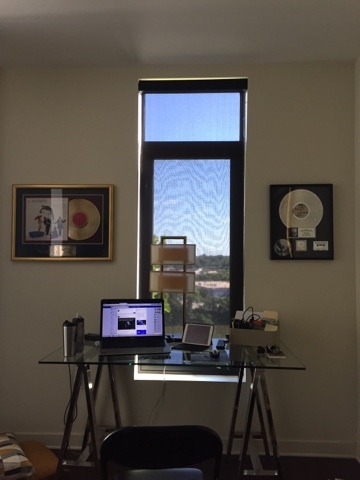 It's Nashville so there are gold and platinum albums on the wall. 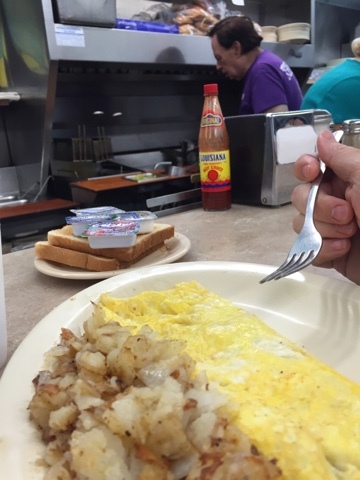 I saved last night's dinner for Nashville and found the Hermitage Cafe right around the corner. Breakfast for 10pm supper! Reminded me of the old Hamburger Shop in Sioux Falls. It's Nashville so it's been featured in a country music video. Enough! Off to begin Part 2. The next Saturday Coffee Shop Ride will be Saturday August 29. We'll depart at 9am from Black Sheep Coffee near the intersection of Grange Ave and 12th Street. Here is a link to the general expectations of the Saturday Coffee Shop Rides. Faster riders may find the speed of this ride a bit mentally challenging. If you want to see the entirety of the Saturday Coffee Shop Ride posts follow this link. Today began early as I departed home on a fully geared front suspended off-road bicycle and an aptly named Camelbak perched upon my back as if it were the hump of a camel. This was somewhat unusual gear selection for the Saturday Coffee Shop Ride, however today I had plans within plans. I met The Owner and One Of The Owner's Daughters at the Elmen Trailhead. I found them in conversation with a couple well known hoodlums - erm, riders. We bid them farewell and were off to The Falls Park Farmer's Market together while the two riders continued their travels around the north part of the bike trail. At the farmer's market we joined a family of three generations. We found a young man on a homemade bamboo rig. Another, even younger man was on a beautiful grey and light blue Purefix. Parts he apparently selected on his own. The Owner and One Of The Owner's Daughters were on a bicycle built for tandem. The MinusCar Project Saturday Coffee Shop Ride takes all kinds. Just before our 9:15-ish departure - yeah, we wait for people if we know they're coming - the two hoodlums appeared and were briefly greeted in the form of the Hello Again Wave. Our first order of business was to arrange the requisite group photo. This one at the Pioneer Memorial. After some short singletrack and even shorter bits of avoiding fresh dirt piles we crossed Cliff Ave entered the land of "hey, I've never been here before" and "do you know where we are?" I surely enjoy that. Our northernmost point was the Sanford Research building where the horses run but not free. Along Benson Road we were passed by a half-dozen cars which may well have been a record until we later traversed North Drive and were passed by more and at much closer proximity. If I were to do that piece over I'd probably ride it differently. In the midst of the North Drive tension a couple inmates played the role of comic foils by inquiring about the likelihood we were heading to Sturgis. There were some very nice views of The City on this route. Art marshaled the back of our ride and captured this picture as we began the Main Ave descent back to The Falls. 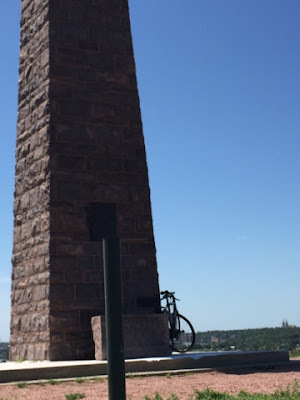 Thanks for the picture Bike Sioux Falls. After cups of coffee, breakfast pizzas and decent conversations were consumed I was off to the remainder of my 35 mile day. A visit to Leaders Park and the long ride home. The icing on the top of my ridecake came with a couple blocks worth of cooling rainfall as I arrived home. Ahhhh...Saturday! 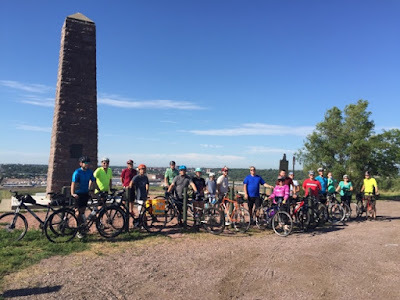 The next Saturday Coffee Shop Ride will be July 25. It will depart from the Falls Park Farmer's Market north of Falls Park. The route will take us immediately up the hill by the penitentiary and on to the Pioneer Memorial that overlooks Morrells - erm, the city. 50 yards of singletrack will put us in north Sioux Falls where we'll see the place the Schwan's trucks sleep, the Sanford Research Center and the seemingly forgotten Seubert Ave. On the return trip we'll narrowly miss the entrance to Lacey Park, loop around Presentation Street, skim the entrance to the South Dakota State Penitentiary and zoom down Main Street back to the farmer's market for freshly made coffee and/or pizza and/or brats and/or burgers. The ride leaves at 9am. The loop is barely under 11 miles and is as always weather adjustable. There are general expectations of the Saturday Coffee Shop Rides. Faster riders may find the slowish speed of this ride mentally taxing. Hey! Thanks for checking in before you head off for your July 4 holiday. It's good you did, I have a pressing issue for Sioux Falls riders Tuesday July 7 that I must communicate. Today is the day that HB 1030 - that's the bill that requires 3' of passing space when a car is passing a bicycle at less than 35mph and 6' of passing space when a car is passing a bicycle at more and 35mph - becomes South Dakota law. 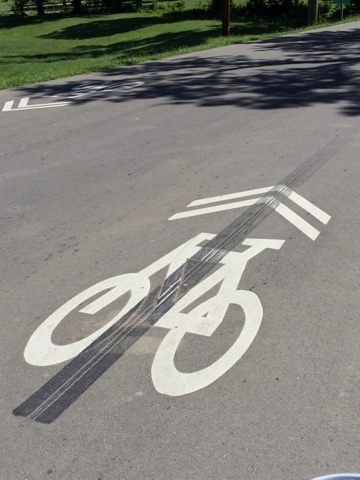 All over the state drivers have begun to move over when they overtake a bicycle on the roadway. I can just feel that it's true. That previous sentence was a bit sarcastic. HOWEVER, it is my unresearched, unscientific, completely experiential and subjective opinion that as I ride on city roads drivers are trying to get used to how this space will work. 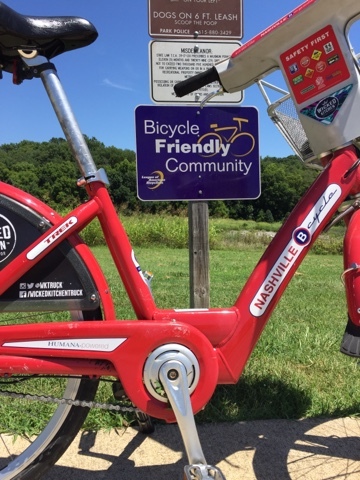 League of American Bicyclist's Bicycle Friendly Community Specialist Steve Clark commented that this is probably the best safe passing law in the country. We said yes, we are aware. If you're looking for an article to share there are plenty. Because it has my name in it this one is my favorite. It's a WNAX Radio production which means it's audience is people sitting in tractors all across the state. There's this one from KELOLAND that is an excellent example of how to bury a lead in a news article. Sheesh! And finally South Dakota Public Broadcasting talked to SDDOT staff and showed again what I already knew - there's a lot of people in SDDOT that don't understand bicycle law and what it means for safe roadway use. Speaking of burying the lead - Second, the 7th. 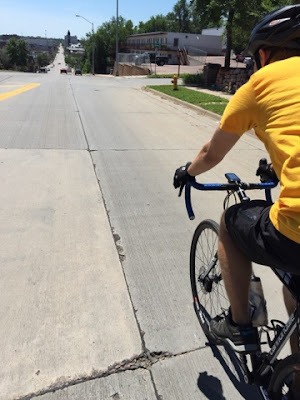 Yesterday the Sioux Falls City Council heard about a proposed Complete Streets Policy. I know this because the Argus Leader published an article about it. Here's the thing. When something lands in the informational meeting it means the council usually votes on it the following Tuesday. 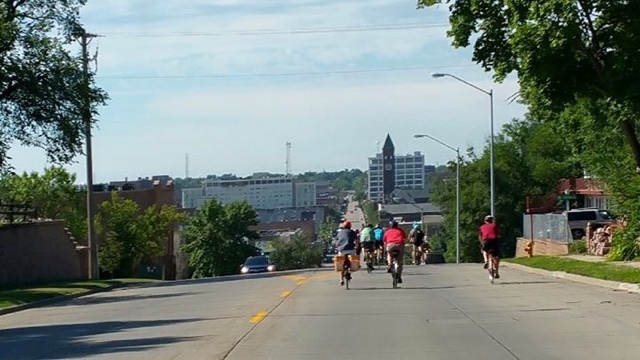 Tuesday July 7th 7pm meeting the Sioux Falls City Council will likely vote on a Complete Streets Policy for the City of Sioux Falls. It would be great if riders and walkers came to this meeting and asked the council to approve the policy. 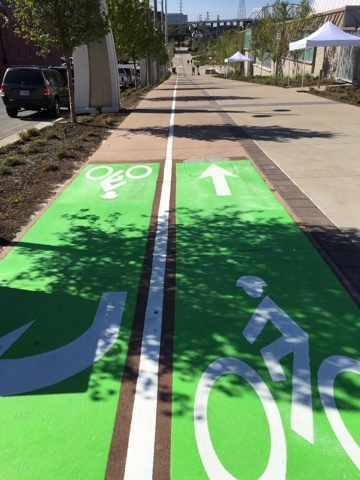 "City Planning Director Mike Cooper made his first pitch to the council...a complete streets policy that would direct multiple city departments to consider all modes of transportation when planning road rebuilds and new streets." It's is a big change to have this become a city policy. The policy means streets for every user get created because "it's what we do." The current situation is more - streets for every user get created if someone brings up the possibility at the right time, in the right place, and with the right people. Please consider coming to the council meeting and voicing your supportive opinion on the matter. Read the Argus article. Go a step further and watch the Informational Meeting video - relevant portion starts at 17:50. Pick a point and echo it to the council Tuesday, July 7, 7pm. Not sure what Complete Streets are? Watch the Informational Meeting video. Look-in while city staff explain it to city council.